Previously I wrote about Bushi Matsumora – The Movie. Today it is “Bushi Matsumora – The Novel”. The heroic tales of Matsumora Kōsaku were written down in the novel “Bushi Matsumora” (武士松茂良) by Matsumora Kōnin 松茂良興仁 (pen-name Matsumura Takesaburō 松村竹三郎). When it was serialized in a number of short stories in the Ryūkyū Shinpō newspaper and published over the course of several months in 1938, the whole thing gained popularity. Due to this popularity the story was made into a stage play. Dramatization for stage was carried out by Tomoyose Teruhiko 友寄英彦, a dentist. Karate instruction for the stage play was provided by no less than Nagamine Shōshin 長嶺将真, founder of the Matsubayashi-ryū and one mainstay of Tomari-te, the regional martial art largely based on Matsumora’s traditions. “Bushi Matsumora” was performed as a stage play by the Sangoza 珊瑚座 theater troupe led by Majikina Yūkō. The stage play received praise not only from the Karate world, but also by the general public. 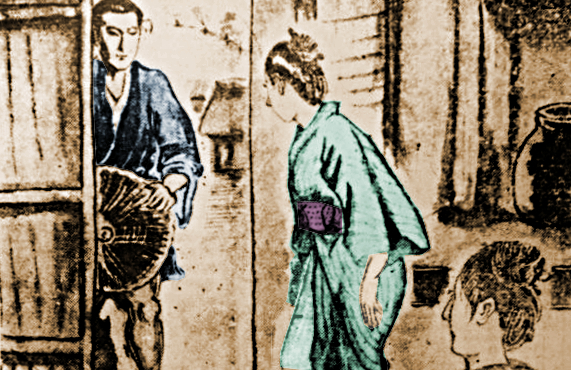 Illustration from the sequel “Bushi Matsumora”. Source: 琉文21. Biblio: Matsumura Kōshō (former family name: Matsumora): Bushi Matsumora Kōsaku Ryakuden: Karate (Tomari-te) Chūkō no So. Naha 1970. © 2017, Andreas Quast. All rights reserved. This entry was posted in Misc, Postwar Okinawa Karate and tagged Bushi Matsumora, Matsumora Kosaku. Bookmark the permalink.